His Excellency Mariano Fernández Amunátegui is not only one of the most important figures in the international Chilean arena, but also an honest man with the capacity of sharing powerful and authentic ideas. 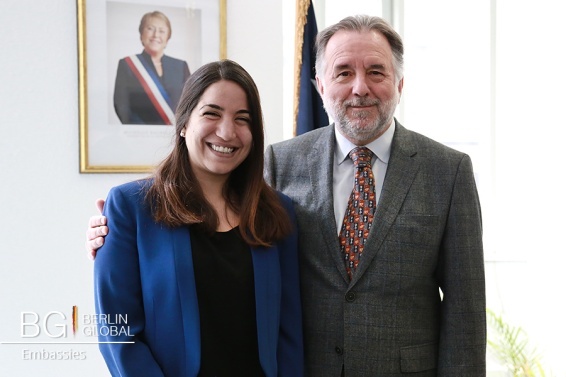 During the interview I had the opportunity to gain a deeper understanding of his diplomatic work, discover the impact that culture can have on international relations, admire the pieces of art that Chilean artists have donated to his excellency, and learn from the personal experiences of the Ambassador. Fernández was born in Santiago de Chile in 1945 and opposed the Pinochet regime during the military dictatorship. At the beginning of the 90’s, he represented Chile as a political ambassador to the European Union. Apart from being the current Chilean Ambassador to Germany, he has been the Ambassador to Italy, Spain, Great Britain, USA and, soon, to the Vatican. 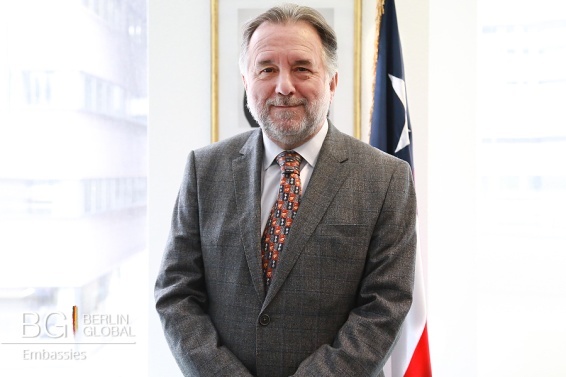 In addition, he worked as the Minister of External Relations of the Republic of Chile and was also designated by the United Nations Secretary-General Ban Ki-moon the Special Representative for Haiti and Head of the United Nations Stabilization Mission in Haiti. During the Chilean authoritarian regime, you lived in Germany in exile. The first time I arrived to Germany I was 26 years old. I spent here eleven crucial years of my life and, when I left in 1982, this country had become my second closest nation after Chile. I have lived in the west side of this city when it was divided and completely different, and I have had the opportunity to see its development and the amazing changes that the unity brought. How did this affect your relationship with Germany? When I had to come back to Germany as an ambassador it was like coming back home. Even after 34 years living away, and after all the changes, Berlin felt surprisingly familiar. And what do you think about Berlin? Berlin is nowadays a real cultural and political metropolis. But, furthermore, Germany as a state plays a crucial role in the progress and the decisions taken in Europe. For me, it is as comfortable as filling to work here. And, in addition, it is stimulating to represent Chile in such a significant nation in the economical and political fields. Apart from being the Ambassador to Germany, you have worked in many different and influential positions. Which one have you found to be the most challenging? In order to understand the challenge, we must understand the history. Nowadays, being the representative of Chile to the European Union may not seem that demanding: there is a good relationship; we have an association agreement and so on. But, in 1990, just few months after the end of the Chilean military dictatorship, the situation was very different. Few people had a knowledge about Chile, we did not have any representation and we had just initiated the transitional process to a real democracy. But it was even more difficult the situation in the beginning of the 70's, when I was the third Secretary to the Embassy of the Federal Republic of Germany during the Allende government. At that time, being Germany influenced by the Cold War, it was a real challenge. What about your experience as an Ambassador? When I think about my roles in Italy, in Spain, in Great Britain or even in the United States they appear to me more as an adventure than a challenge. My role was not hard because Chile had the good will of a country that is starting an important positive change. We were not anymore under the dictatorship of Pinochet and, at that point, I was representing a renewed country with an exciting future in front of it. In what way do you think the role of and Ambassadors is significant for the success of inter‐governmental relations? When you represent a relevant country, you can play a role in the political sphere. You have a good structure, an established agenda and specialized teams. But, when you represent a medium-size country, or a small country, or an unknown country, the possibilities are infinite. The individuals and their initiatives become much more significant: you can play a role in culture, in science, in education... you can start exchanging programs between universities or you can work in the promotion of your national art, music or literature. For example, we are hosting an exhibition of two young Chilean painters right now. In berlin there are now more than 200 Chilean artists: DJ's, actors, musicians, writers... This is a great part of what diplomacy means, and it is as motivating as important for an ambassador. Not everybody would agree with this. After years of experience, I believe the role of culture has been decisive for the understanding between nations. For example, think about the cold war. During 70 years the political control reigned over the countries and, if you wanted to develop any initiative, it was necessary to have political agreements. After that, the trading relations started and the communication between countries rose from the commercial market. It was in the exchange of products and the international industries that the necessity of knowing the other appeared, and the culture exchange begin to link countries over the world. “Culture became not so depending from political interest, it was dynamic and it permitted to spread the differences but, also, the similarities. Well, it was a way of presenting your country to the rest of the world and receiving the cultural inputs from abroad, and I believe this is what Cultural Diplomacy is. It is about sharing and understanding, about accepting the differences and learning from them. And do you think Culture Diplomacy can help to prevent conflicts? The more we know each other, the easier it is to live in peace. When you show your country to another country, people begins to understand your culture, you begin to understand them, and identity takes a new form. Because culture, for me, is not only pieces of art. Culture is the way of living of a society, a way to do politics. And sharing this culture, sharing identities, is what has created the communication between people that produces expressions and that, ultimately, leads to peace. Finally, after a whole career dedicated to international relations, what advice would you give to young people that would want to follow your steps? First of all, I would tell them to not forget who they were when they were young. So, try to live in a way in which you always remember where you come from. One of the problems of power is that it makes you neglect your beginning as a politician, and you begin to see relations from a hierarchic point of view. And here is when you miss the point and you stop learning: when you underestimate people. So, never underestimate anyone. Even if they seem to be away from your goals or even when you don't have any personal interest in their roles. Do not follow people because they are apparently so important to society, or because they are important for your career. Show interest and be captivated by people that are important to you, people you believe in. Sometimes, the most powerful relationships come from places you did not expect.